An intense police investigation into a high-level and sophisticated drug network has resulted in the arrest of three men and the seizure of $7.6 million in drugs and over $300,000 in cash. 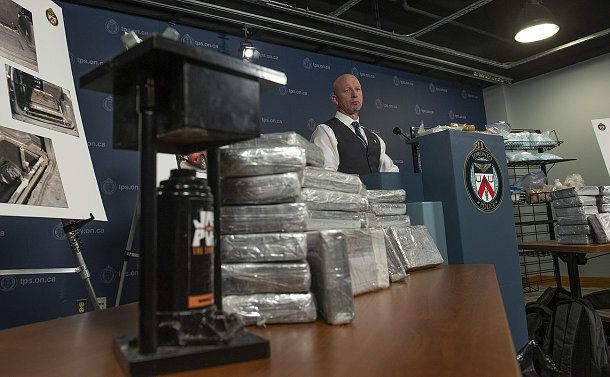 Toronto Police Major Drug investigators launched Project Sparta early last year into the distribution network of illicit drugs. At a news conference at police headquarters on January 25, Insp. Steve Watts of the Drug Squad said the investigation utilized different types of intelligence-led techniques. On January 9, investigators arrested and charged Adrian Narayan and Nicholas Droege, both 20, and 34-year-old Hung Nguyen. They face several charges, including possession for the purpose of trafficking and possession of proceeds of crime. Droege and Nguyen are out on bail and will return to court on February 20. Narayan remains in custody. A total of six search warrants were executed on three homes and three motor vehicles in the areas of Bathurst St. & Follis Ave., Adelaide St. W. & Simcoe St. and Bay and Grosvenor Sts. Watt said two of the vehicles had hidden compartments to hide drugs. The alleged seizure includes 68 kilograms of powder cocaine, five kilos of MDMA, seven kilograms of ketamine, one kilogram of crystal methamphetamine and $343,759 in Canadian currency. Chief Mark Saunders praised the Drug Squad and the other specialized units for the outstanding work they are doing to keep Toronto safe.